Signup confirmation, often called "double-optin," ensures your subscribers willingly joined your email list. If you don't use double-optin, you're more likely to end up in the spam folder. 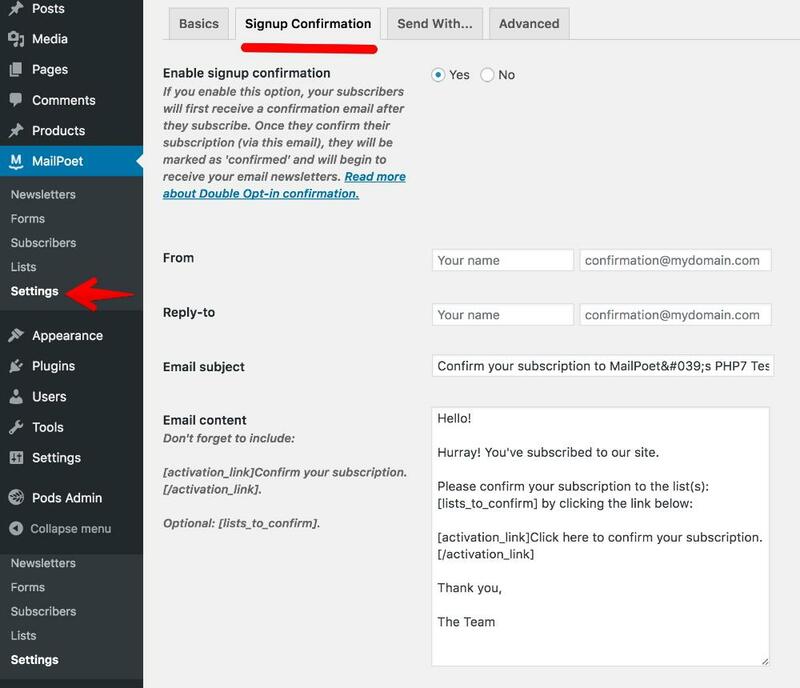 Important: signup confirmation is enforced if you send with the MailPoet Sending Service. This last point is important. You should think about your audience in terms of quantity over quality. The aim is to increase your open rate, not simply increase your subscriber count. Convinced that signup confirmation is important? Read on. Until a subscriber confirms his/her subscription, he/she won't receive any emails. Over 25% of My Subscribers Are Unconfirmed! Don't sweat it. It's normal to have plenty of unconfirmed subscribers. If your mailing list is for an older generation of people or for a group of non-computer users, there's a good chance that your unconfirmed rate will be 30% or more. This is normal. Tip: Make sure your confirmation email's subject is a call-to-action. Read our guide to writing a great subject line. A good example: Almost there... activate your subscription! A bad example: We've registered your subscription, thank you. 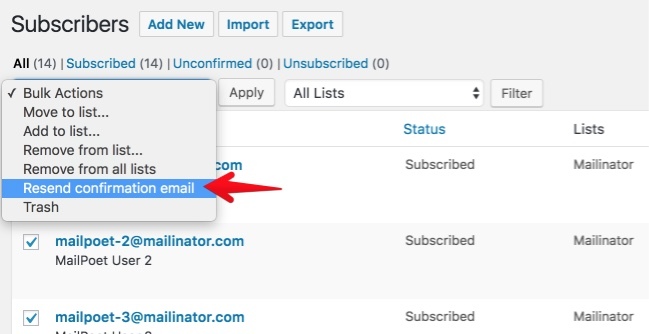 On the Subscribers page, select the subscribers that are Unsubscribed, click on the Bulk Actions drop-down menu, select the option Resend confirmation email and hit the Apply button. Your audience may not be online on a regular basis. When they get online, your confirmation email is lost in their inbox. Even worse, your confirmation emails are labeled as spam and never show up in the inbox. Your site is a membership site and you only send to your WordPress users.